A job found me few months ago. Yeah, it works that way. And although I'm kind of a bear, I decided to leave my cocoon for a while and accept the adventure. The location was tempting I shall confess, so here I am crossing the ocean and moving to Venice, California, in a few days now. To celebrate this I've decided to create a picture. 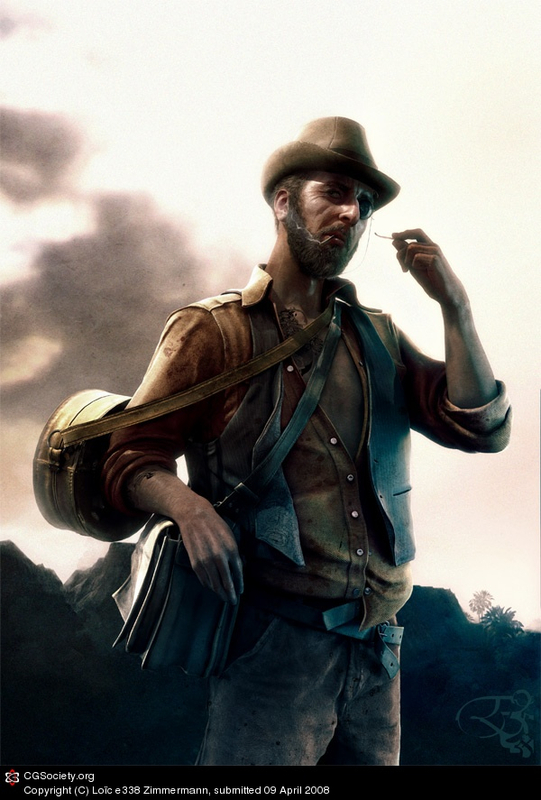 Basically, this is me, 10 years older and 140 years ago, as a european dude moving for the goldrush. Hey it's not about the money (especially as far as the Euro goes...) !! Thanks to my fella Fox who inspired me in creating a new CG illustration (understand more 3D, less 2D). This is kind of an exercise for me, pushing my limits a bit further, experimenting, etc... in order to feel more comfortable at work, and also to be faster for my regular illustration works. Still, there is a lot of post process in Photoshop to put more groove in the final image, mostly for the colours, levels and stuff. Background is a matte painting. Character started from my CG double from the Tattoo project. Zbrush for detailling and aging. Same process for the clothes. 600meg of textures. Mental ray, 3 points lighting with a slight HDRI addon. That's it. kinda classic you may say. This is kind of a breakdown compared to the regular hero stereotype thingy, but eh! At least it's real. Well, as real as one can be, pushed into CG.